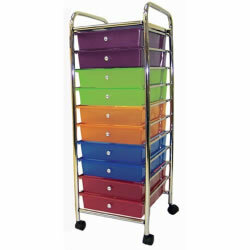 If you have to keep your creativity supplies mobile or you attend conferences of any sort, this is the cart for you! 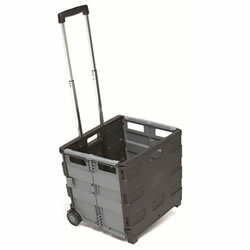 Just like most carts of this sort, the sides fold down for easy storage. The bonus feature of this particular cart, however, is the multitude of pockets and the cloth "saddle bag" that keeps contents inside! I LOVE the zippered pockets! The only small drawback is the telescoping handle, which sometimes gets a bit stuck between positions. Honestly, most suitcases do this as well, so it's worth a little elbow grease for the multitude of positives with this cart!! 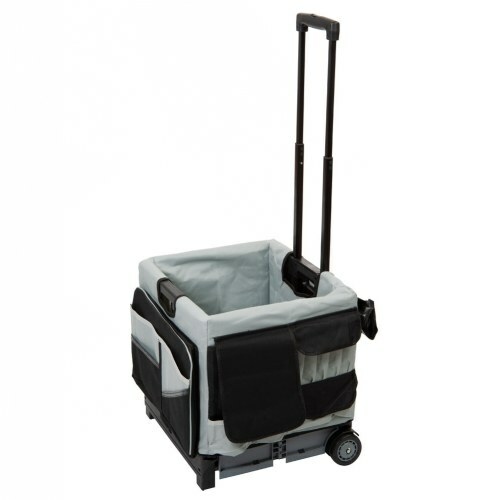 It is very convenient and carries many of my materials. 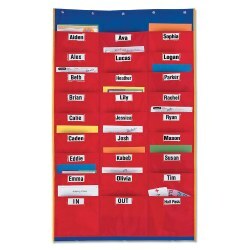 I really think that the rolling organizer is awesome. I don't have to throw small items in the same crate because the saddles provide that organization I need to place the small and other items in the pockets and know exactly where to find them. Thanks for making this excellent product and I am sure we will be ordering more in the near future. Thank you! Greatful and happy customer!